Elijah: Welcome! You’ve found your way to our new segment! Aren’t you excited! 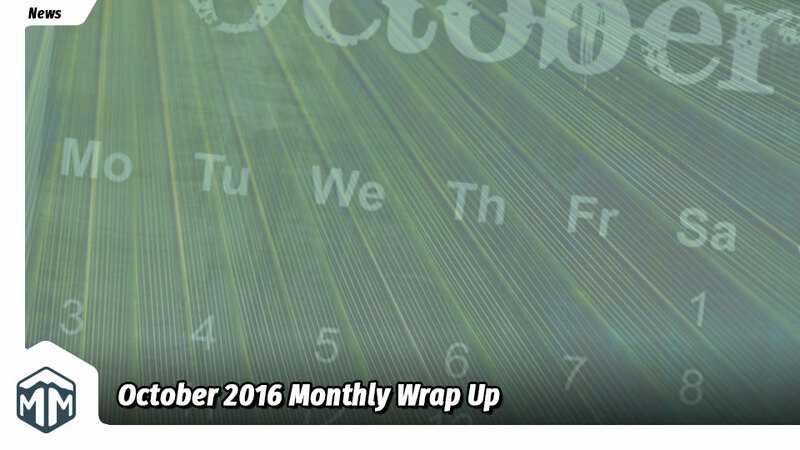 Elijah: Well, I was getting there… Anyway, you’ve found yourself amongst our Monthly Wrap Up! Aren’t you excited?! Andy: But why should they be excited?! Elijah: Because we’re going to be talking about all the cool stuff we played, saw, and watched this month! Andy: Ooohh.. That sounds fun! Elijah: It is! Er… Will be! Let’s just see what happens! Elijah: This was a great month of gaming for me! I had three huge games show up in the mail. Literally. They are all massive games! Look at them! Mechs vs. Minions, Seafall, and Vinhos all in one month! Oh my! Luckily, I was actually able to get them all to the table. We had a rough start with Seafall after messing up a few vital rules, but overall, we’ve been having a blast with it! It’s not at all what I expected, but I’m not quite sure what I expected anyway. Still, this game is a beast! We’re three games in so far and it has been the highlight of our weeks. Rob seems to have really dug deep to make sure the “legacy” aspects are extremely fun and rewarding. I just want to know what’s in those chests! Andy: I saw your terrible board game pun. You should be ashamed. I also was able to get Vinhos to the table a few weeks back. We made a whole night out of it. We had wine, Italian food, and Bossa Nova music. It was great! I’ve actually gotten to do three “theme nights” this month. I’ve got the bug… Keep an eye out on a write up on them next week! Andy: You can keep your wine and your Bossa Nova…I’ve got cabbages and tulips! In Seeland that is. Seeland is set in The Netherlands and has players planting and harvesting cabbages and tulips and has the coolest windmill meeples (windmeeples! Did I just make up a new word?!). I’ve played it a number of times now and Seeland has officially taken the spot of my “default gateway game”. Who knew that planting crops and building windmills in the Netherlands would make for such a great game?! Seeland takes just minutes to explain, less than an hour to play, and it’s really high scoring too! Any game that lets me score 250 points is a winner in my book! If you haven’t played Seeland, then you should really try it out. It’s even really cheap on Amazon right now; currently only $16.50! I also got to play Hamsterrolle for the first time. I’ve seen pictures of this one before, but they simply don’t do this game justice. It’s so much cooler in person. Hamsterrolle is equal parts art installment, dexterity game, and push your luck. You keep adding pieces to “the wheel” in hopes that your additions don’t bring the rest of the pieces crumbling down around you! Elijah: Ahhh… Hamsterolle. What a classic. Of course, I’m a sucker for dexterity games. Shame I didn’t get my hands on this one earlier, because it definitely would have made it onto my Top Six Dexterity Games [link] article. Now that I think of it, I’ve added quite a few more dex games to my collection since then. Maybe I should write a follow up? Elijah: Well, if you’ve payed attention to my social media feeds lately, you’ll probably know what my pick is… Mechs vs. Minions! After ten games of Mechs vs. Minions, I think I have a pretty good feel for it. I’ve only made it through the intro and first four missions with my roommate, but man it’s good! The production stands up on it’s own, but the gameplay is also a blast! So far everyone that i’ve shown this to has fallen in love with it and for good reason! I wasn’t expecting to enjoy this one at first, but now I can’t wait to make it through the rest of the campaign! Hopefully I’ll be able to get a full review out in the next couple months. Andy: Speaking of games we’d like to review, I discovered Lords of Vegas this month. I’d seen people talking about it, but for some reason I always ignored it. I finally decided to try it out, and it’s instantly become one of my favorite games. It’s an area control game with a Vegas theme. I’ve played it four times now and I’m loving it more and more each time. Such a great theme, unique components and gameplay, and it plays fast too. Elijah: Andy, have you gotten a chance to watch Must Love Board Games yet? Andy: Nope. I’ve got it bookmarked though! Elijah: Go watch it! Now! Man, I love it when things like this pop up. It’s so cool that we have a hobby that supports each other enough to make these things possible! For those who are unfamiliar, Must Love Board Games is a film from Hedges Pictures about the struggles of relationships within a small gaming group. When Quinn meets David she has to decide if he is a worthy suitor according to the rules of dating and tabletop gaming. As the weekly game nights go on, the couple adventures through some of the most popular board games in the world and discovers the true meaning of romance. If you’re a fan of Board With Life (which I also strongly recommend) then you should give this one a watch. Definitely check it out if you’re looking for something entertaining and geeky to watch! Andy: Speaking of how cool it is when everyone in the hobby rallies together to support each other, did you see what happened at Essen? Elijah: You mean how a professional thief stole Ludi Creations’ cash box from their booth?! I did! How terrible! Andy: Indeed! Luckily, the hobby rallied together to help them out in their time of need! They decided to try to make the best of it and so they came up with a “nano-game” aptly named “Steal This Game.” Thanks to lots of generous industry folks who donated tons of time that night, it was up on kickstarter the next morning. They were able to raise more than enough to cover what was stolen! Elijah: Wow. I love this hobby! Andy: Me too! There are so many talented and creative people that are a part of it. That reminds me, I came across this great video from Actualol where he “sings” his board game collection! Elijah: We had a great month of articles this month, didn’t we Andy? Elijah: You’re right. Unfortunately, we were having a hard time pumping out the news segment every week on our own. With everyone here having full time jobs outside of writing articles, we found that the news segment was becoming a bit “robotic” for us. It began to feel like more of an obligation instead of something that we really wanted to do. Andy: Yep. Ultimately, we decided to put that aside for now and keep Fridays open for things that we really want to do instead. That might mean that our friday content won’t be as consistent, but we want to make sure that it is quality content first! Elijah: Anyway, check out some of the articles that we published this month! So you like board games… What now? Elijah: That’s it! Another month done and on the books! Andy: And what a great month it was! It’s always interesting when we try something new like this… Will it be good? Will people like it? Should we do it again?! Elijah: …why don’t we just ask them? Andy: Oh yes! What do you all think about this segment? We’d love to hear your input in the comments below, on twitter, facebook, or through email! Let us know if this is something you’d like to see more of!